Since I was new to the monastery, I didn't really know what the schedule was. I asked one of the girls on the mission trip what time people usually start doing things, and she said that there was chapel at 6:45 the next morning. 6:45. That's. So. Early. Important little piece of knowledge about me: I am not a morning person. No matter how early I go to sleep the night before, I can easily sleep in until 11 or 12 the next day. That probably has something to do with the fact that I get little to no sleep during the school year (sleep deficit is definitely a thing) but 6:45 is really early. No matter how early it was, though, I was a guest and ought to be respectful. So I dragged myself out of bed at 6:20 to give myself enough time to make sure I was awake before we went to chapel. I'm glad I went, because it was very interesting. I'd never been to an Orthodox service before, so I'm glad I got to experience it. It was beautiful and entirely different than any of the Catholic or Protestant services my friends had taken me to over the years. I was also very flattered when one of the ladies on the mission trip said “if you aren't Orthodox, you're doing a great job of faking it.” The last thing I wanted to do was anything that would be rude or offensive, since the mothers were so nice about letting me stay for the night. I later walked down a path from the monastery to the edge of the lake. 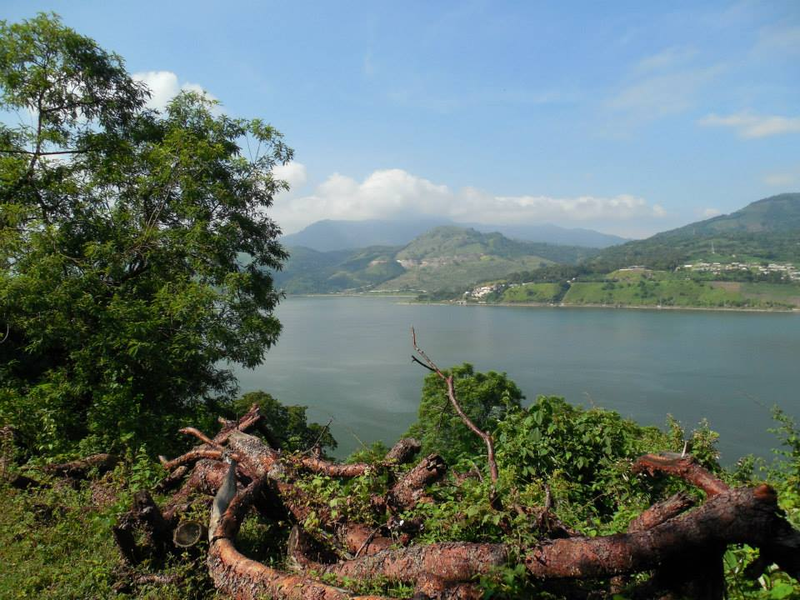 The monastery is situated on the slope of a mountain, and at the bottom is Lake Amatitlán. It was a really beautiful walk, although once I got down to the lakeside, I realized that the lake is actually disgusting. There's a ton of trash and this bright green gunk lining the edges and it doesn't look clean at all. Which is really unfortunate, because it's such a beautiful area. I also realized as I was walking back up to the monastery that I'm terribly out of shape. I was out of breath after just a few minutes. More things that I need to work on. Since I still had several hours before I was leaving to go to Amatitlán (the city), I helped the mission group pull weeds in the garden of the main compound, which also felt like a waste of time because literally anyone could have done that, why have some random foreigner come do it? Of course, it doesn't hurt to help if you're already there. Once I got to Amatitlán, I met up with Yojana, a lady that the monastery put FTF in contact with. Ryan had previously stayed with her family for a while as well. We met in the main park, which was really pretty. The city was nice, certainly not like super modern, but it didn't feel like a typical “third world” city. It just felt like a place people lived, where they went about their daily lives. So first of all, Yojana's family is incredibly kind. I immediately felt comfortable in their house, which was quite nice. In fact, their TV was nicer than the one my family has at home. I think we Americans too often buy into this idea that everyone living in a “third world” or “developing” country is poor. Everyone over there must live much harder lives than we do. They all need water and electricity and money. But Yojana's family was a normal middle class family who didn't live decadently, but certainly lived comfortably. I ended up spending most of the day playing Wii with her three kids, which was fun, but nothing much different from what I might do with my younger brother at home. I also talked to Yojana about San Pedro, the village I was going to live in for the next two days after I left their home. She told me about how poor they were, and her church often takes clothes to them and to other villages because the kids don't have nice clothes. That comment, to me, was very interesting. Most people (including me) have (or in my case, had) this ridiculous, patriarchal notion that Americans have to go on mission or volunteer trips to bring these people basic necessities like clothes. But in this case, at least, that's clearly not true. Guatemalans are just as capable of helping other Guatemalans as we are. Amatitlán was a very nice change from the monastery. It felt like I was starting to diverge from Whitman's highway – the well-traveled, familiar place that westerners visit in Guatemala. I wasn't living in monastery with a mission trip anymore, and I certainly hadn't moved into a nice hotel where I was surrounded by foreigners. That being said, I was definitely not off the highway yet. It was more like I was on the exit ramp, on my way to the less-worn, smaller streets. Funny side story: we got pizza for dinner. We were going to get Domino's, but since we have that in America, they decided we should get something different since I can get that at home (I also really don't like Domino's so I was happy about that). They also had wifi at their house, and their older son wanted to friend me on Facebook. So they let me connect to it so I could accept his friend request. But then I had access to Facebook and email and everything on the internet, which actually made me really sad. I felt like I had been starting to integrate myself into Guatemala and then suddenly I got sucked back into something as familiar as my inbox. And it's hard to explain, but I liked not having instant contact with everything back at home and at school. And I was sad that I suddenly had it again. It made it seem kind of like I wasn't even in Guatemala any more.